Can you confirm these amateur observations of Boaedon fuliginosus? arabicus: Yemen; Type locality: EI Kubar, Amiri Country, SW. Arabia" [= EI Kubar, Ad Dali" Govern., SW Yemen, 13°48'N, 44°45'E, elevation 1350 m]. 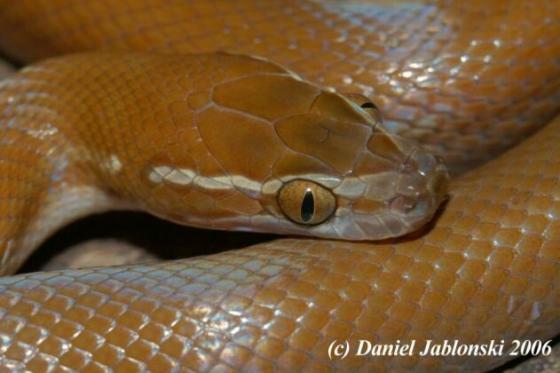 Comment Synonymy: Thorpe & McCarthy (1978) showed that Lamprophis lineatus is a distinct species in West Africa rather than a color morph of L. fuliginosus, but in Southern Africa the latter species takes on the color pattern of the former. Note, however, that the two species have been confused in the literature and therefore references to either species may be erroneous. 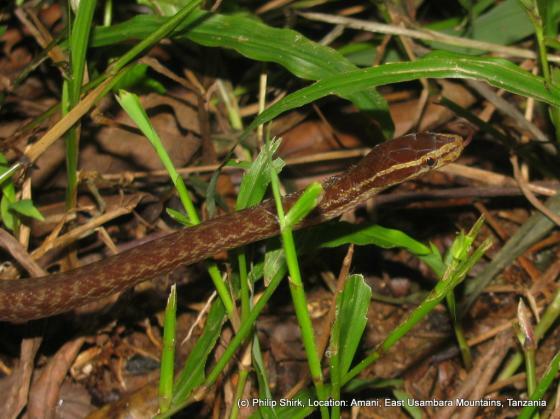 Boaedon (Lamprophis) arabicus is listed as “tentative” by Hughes 1997: 72, based on the number of ventrals being higher than in other species (240-242 in females [n=7] and 226 in males [n= 1]). However, the number in females overlaps with fuliginosus and the sample size for males is too small, given the significant variation in this species. Nevertheless, Wallach et al. 2014 cite Hughes 1997 as source for their decision. Subspecies: L. f. bedriagae is in doubt fide SCHLEICH et al. (1996). Not sure if this is Boodon bedriagae BOULENGER 1906 which was described from S. Thomé. Morphology: Knietsch (2006) showed that this species can change its color from black to olive green. Distribution: Populations of Lamprophis fuliginosus from the Horn of Africa southwards to the Cape with lower number of ventral scales in both sexes are regarded by Hughes (1997) as a separate species: Lamprophis capensis (Dumeril, 1854). This opinion was followed by and Broadley et al (2003) and Marais (2004). The Namib subspecies mentalis is regared by some authors as a separate species (Branch 1998). The type locality was given erroneously as “Java” by BOIE 1827. Several populations previously included in B. fuliginosus have been split off into separate species by Trape & Mediannikov 2016, so that “true” fuliginosus are probably restricted to West Africa and Niger, Nigeria. The restricted range remains thus a bit unclear (F. Trape, pers. comm., 10 Jan 2017). Distribution: Not in Angola fide Marques et al. 2018; in Angola it is replaced by B. angolensis. Broadley, D.G. 1958. Snakes of Southern Rhodesia. 7. 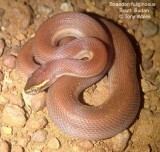 The Common House snake (Boaedon fuliginosus fuliginosus Boie). Afr. Wild Life 12: 197-199. Hofer, D. 2002. The São Tomé and Principé Handbook. D. Hofer Verlag, Bern, 152 pp. Peters,W. 1882. Naturwissenschaftliche Reise nach Mossambique auf Befehl seiner Majestät es Königs Friedrich Wilhelm IV. in den Jahren 1842 bis 1848 ausgefeführt von Wilhelm C. Peters. Zoologie III. Amphibien. Berlin (Reimer), 191pp. Razzetti, E. & Msuya, C.A. 2002. Field guide to the amphibians and reptiles of Arusha National Park (Tanzania). Publ. Ed. Negri Istituto, Oikos, Varese, 84 pp. Roux-Estève, R. & J. GUIBE 1965. Étude comparée de Boaedon fuliginosus (Boié) et Boaedon lineatus D. et B. (Ophidiens). Bull. Inst. Fond. Afr. Noire 27 (A-1): 397-409.